global $post; Bat Removal & Control Services Toronto, Mississauga, Vaughan - Gotcha Wildlife Inc.
With deforestation bats are increasingly losing natural roosting sites and therefore using more and more man-made structures. This has made bat control in urban areas much more difficult. Common roosting areas include high buildings, attics, soffits, and under sidings. Common areas of entry include soffit gaps, fascia gaps, roof fence, chimneys, brick openings and any damaged or open doors/windows. Not only is bat removal essential but so is closing off the gaps from where the bats are entering. Bat control will be difficult if all areas of entry are not sealed, and you also run the risk that other rodents will return to take advantage of the space. At Gotcha Wildlife, we take care of everything for you, from bat removal to sealing off all areas, ensuring there is no chance of a repeat incident. Bat Removal is a task that needs to be handled by professionals. Bats will likely have many small passages where they enter your home. These holes can be very small but we will check everything meticulously to ensure every area is sealed. 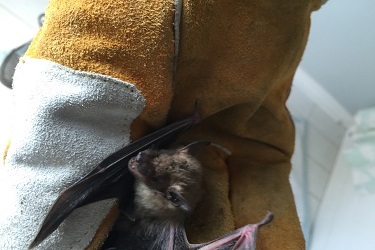 Choose Gotcha Wildlife For bat removal in Toronto, to give you total peace of mind that the problem is being dealt with effectively, by the best people in the industry. We are experts at what we do. For jobs like bat removal you need a company who are experienced and know how to manage the whole process without making any mistakes. Get in touch us and we will be happy to discuss your situation and explain how we will help you. WHAT HEALTH CONCERNS DO BATS RAISE? A technician will thoroughly inspect your property in order to locate the point of entry. Once the area of entry is located a one-way release system will be installed. Thus, humanly allowing bats to leave but not re-enter. If a colony is present, a netting release system will be used to allow greater number of bats to vacate at once. In addition, to prevent future re-entry, other common areas on roof should be secured. In many cases bat infestations will contaminate your attic with large amounts of urine and guano. Accumulation of guano can become dry and airborne, transmitting histoplasmosis (a systemic fungus). This presents a hazard to your health and a thorough clean out may be required. This process consists of cleaning out all urine soaked insulation, removing all guano, disinfecting and replacing all contaminated insulation. Studies have shown that bats have one of the lowest occurrences of rabies of any mammal. Bats are also known to harbor the BATBUG and BEDBUG.